Paper theater (also called toy theater) is a form of miniature theater dating back to the early Victorian era. Paper theaters were often printed on posters and sold as kits at playhouses, opera houses, and vaudeville theaters, and proved to be an effective marketing tool. The kits were assembled at home and the plays performed for family members and guests, sometimes with live musical accompaniment and sound effects. At the height of its popularity over 300 European theaters were selling kits, but paper theater saw a drastic decline in popularity in the late 19th century as realism began to dominate the dramatic arts, and again with the arrival of television. 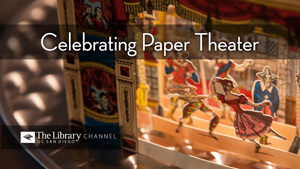 Thankfully, paper theater survived near-extinction and has enjoyed renewed popularity in recent years among puppeteers, writers, hobbyists, designers, educators, and filmmakers. Several publishers now offer replicas of famous paper theater kits as well as new models, and there are numerous international paper theater festivals throughout the Americas and Europe. One such festival is presented yearly at the UC San Diego Library under the direction of staffer and “paper devotee” Scott Paulson. The Library’s Paper Theater Festival (billed as “The Smallest Show on Earth”) features examples of the form from Paulson’s personal collection, as well as performances of student-authored plays. The exhibition runs the gamut of paper theater history and formats, including posters, pop-ups, postcards, and souvenir books. Paulson attributes his interest in the medium to seeing Franco Zeffirelli’s autobiographical film “Tea with Mussolini,” which prominently features a paper theater performance. Others are drawn by paper theater’s tactile nature and by its value as an interactive educational toy, one that serves to stimulate a child’s creativity. A number of well-known figures were introduced to art by paper theater or have worked with the form, including Charles Dickens, Robert Louis Stevenson, Winston Churchill, Edward Gorey, Maurice Sendak, Ingmar Bergman, Terry Gilliam, Pablo Picasso, and Orson Welles, to name just a few. Like these luminaries Paulson appreciates paper theater both as a fascinating link to theater history and as an art form in its own right, one that celebrates craftsmanship and beauty on an intimate scale. He inaugurated the annual Festival in order to share his enthusiasm and to encourage others – children especially – to step away from our technocratic age for a time and let their imaginations take the lead.